Vitamin D is just one of many vitamins that are required by the human body. Unfortunately, many people are Vitamin D deficient, which causes them to spend large portions of their lives in states of pain, fatigue, and depression. The point is: failure to get enough Vitamin D can be debilitating. Interested in obtaining a little more information on Vitamin D? You’re in the right place. This post will not only explain what Vitamin D is good for, but will identify sources where you can get it as well. Vitamin D is vitally important to the human body, aiding on physical, emotional, and psychological levels. Not only is Vitamin D vastly important for bone growth and for the regulation of the immune system, but for overall mood as well. This Vitamin helps to fight off everything from cancer, to depression, to heart disease, to multiple sclerosis, and much more. While nothing substantial has been proven thus far, there are studies that associate a Vitamin D deficiency with certain types of cancer. These types of cancer include lung, prostate, breast, and thyroid cancer. It has been estimated that those who are Vitamin D deficient are generally three times more likely to get cancer than those who are not. Several studies have correlated a Vitamin D deficiency with chronic heart disease. These studies show that a lack of Vitamin D can result in hypertension, arterial disease, and stroke, in particular. Studies have also suggested a link between Vitamin D deficiency and depression. In general, the lower the level of Vitamin D in the system, the more severe the depression. In some case studies, depressed individuals were given Vitamin D supplements on a regular basis. At the end of the studies, these individuals reported feeling much happier and upbeat than they had previously. From Where Can You Get Vitamin D? Now, you might be wondering where you can get more Vitamin D? What are its sources? You can easily get Vitamin D from sunlight, from supplements, and from assorted foods. The most natural form of Vitamin D is sunlight, and, particularly, ultraviolet B rays (UVB). These rays shine down and activate cholesterol in your skin. This cholesterol then produces Vitamin D and distributes it to the rest of your body. While most human beings used to get plentiful sunlight, many of us today no longer do so. This has led to a wide-scale increase in Vitamin D deficiencies around the world. 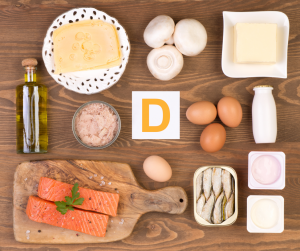 There are certain foods that are naturally high in Vitamin D. These include fish, egg yolks, and mushrooms, to name a few. There are also foods that are fortified with Vitamin D, such as cow’s milk, soy milk, and orange juice. For many people that are deficient in Vitamin D, it is wise to take supplements. A supplement doesn’t have to be worked into a diet; it can simply be taken at the beginning of every day, and forgotten about until the next day. There are many types of Vitamin D supplements on the market, all of which can help you to meet your nutritional needs. Looking for Vitamin D Supplements in Chicago? Want to ensure that you meet your recommended daily requirements for Vitamin D? You might want to consider taking supplements. Looking for Vitamin D supplements in Chicago? The Feely Center for Optimal Health has exactly what you need. Our D 5000 supplement, in particular, is hugely beneficial. It has been proven to aid in bone growth, blood sugar regulation, immune system boosting, and more.